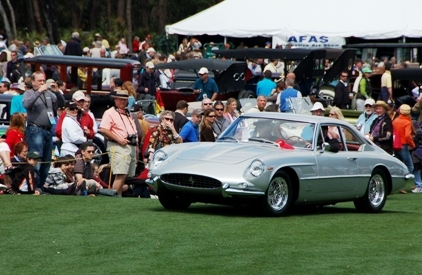 The rich, the glamorous, the beautiful and the serious car collector will be among the thousands to descend on Amelia Island, Florida, north of Jacksonville, next week for one of the region’s most high profile car show events – the Amelia Concours d’Elegance. The Ritz-Carlton, Amelia Island, voted the No. 5 Best Resort in North America by Conde Nast Traveler readers, will be the host to the pageantry which includes a world-class auction and competitions. The setting is serene. Majestic Spanish Oaks and the Atlantic Ocean’s most pristine beaches are the backdrop. 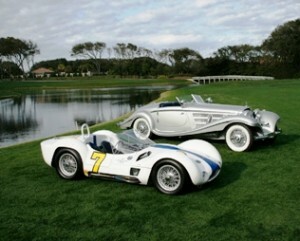 Private parties, galas, wine dinners, and seminars will lead up to Sunday’s big public unveiling of hundreds of classic, collectible, and exotic cars on the fairways of the adjacent golf course. It is a spectacular scene. White sponsor tents speckle the green framing a landscape of auto treasures worth millions! Here is your chance to view rare seldom-seen cars from private collections. Porche, Mercedes-Benz, Maserati, Ferrari, Jaguar, Aston Martin, Rolls-Royce, Bentley are among the luxury brands represented. The official limo of Pope Paul VI will be among the headliners this year. The historic 1965 Mercedes-Benz 600 Pullman landaulet, a favorite of Europe’s elite, will be making its first appearance on U.S. soil at Amelia Island. The vehicle weighs nearly 5000 pounds and features bulletproof glass and a custom single seat designed to raise and lower the pontiff during the car’s procession. The limo was used by three popes over two decades before retiring to the Mercedes-Benz Museum in Stuttgart, Germany. For true car enthusiasts, the auction on March 12, presented by RM Auctions, the world’s largest auction house for quality automobiles is the big draw. Bidder registration is only $200 US and includes an official auction catalog and admission for two to previews, reception and the auction. Be forewarned, it is easy to get caught up in the excitement and the bidding. The buzz is like a drug…it is that same feeling that overcomes most fashionistas when shopping for shoes. This diva ( and I know very little about cars) nearly walked away with a classic Jag for $80,000. When the price tags can be upwards of $1 million… a few thousand seems like peanuts. Gals, be sure to attend the ” Women in Racing” seminar event on Friday morning, which celebrates the gutsy women who broke into this male-dominated sport. Stories of triumph, challenges and determination will encourage you to get behind the wheel for a spin. In fact, you will have your chance. 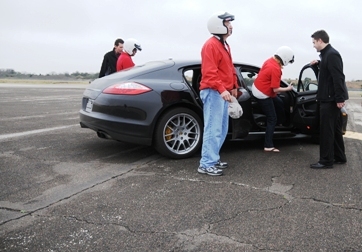 A high speed Porsche Driving Experience is offered on Friday for $175 per person. The ticket fee includes a dull day of activities including a private reception. For all your planning needs, contact the Amelia Island Tourism Office. Special Note: Online Ticket Sales end on March 7. So Hurry! You don’t want to miss this legendary event! Photos Courtesy of Neil Rashba Photography.